I spend so much time eating at Jetblue’s new Terminal 5 at JFK I figured I'd write a mini guide for you to help during travels. First of all the new terminal is awesome! I think I’ve written about the cool touch screen where you can order food and beer right to your gate? Pretty awesome. But they also have a ton of places to eat- everything from your standard fast food burger and sandwiches to more upscale sushi and steak joints. My first visit to the Terminal I had a sushi roll from Deep Blue Sushi. It was a pretty decent roll but way to expensive to ever justify going back. My second time I ate next door to Deep Blue at a little French café place La Vie. I had a fantastic Goat Cheese Arugula salad and washed it down with a bottle of Duvel. The space is a little cramped but if the terminal’s not busy this is a good food and drink option. Across from La Vie is the center of the terminal restaurant conglomerate. On our way to Florida over Thanksgiving we stopped into 5ive Steak and were blown away by how good the fried chicken was. It was a huge portion of insanely crispy meat that was covered in a sweet and sour marmalade glaze. It was so good that we set aside a little extra time to ensure we could eat there again on our way back for Christmas. Unfortunately the second time around was disappointing. The chicken was super dry, the marmalade sauce wasn’t present and the dish itself was much smaller in portion than it was before. I also ordered a burger that time around and it came out way overcooked and with soggy fries. We wrote it off as being a bad showing because of staff holiday leave. We’ll still try it again just not as enthusiastically as before. This trip I decided to walk around a little more, away from the main food area and see what I could find. I checked out all four wings of the terminal and finally settled on New York Sports Grill. Probably the only real “bar” per say in the airport, I thought it would be a good place to catch some Olympic action. They have a pretty draught list but nothing really excited me too much. 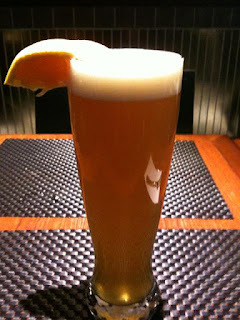 I decided to play it safe and settled on a Shock Top Belgian White beer. First of all this beer was huge! Usually they ask you at airports if you want a large size or not. I guess they took one look at me and assumed I needed one?? And don't get me started on the orange slice. It was HUGE! Do I really need that much vitamin C with my beverage? The beer was okay at first but about halfway through the strong lemony sour taste really started to get to me and I couldn’t finish it. Not a beer I would order again. 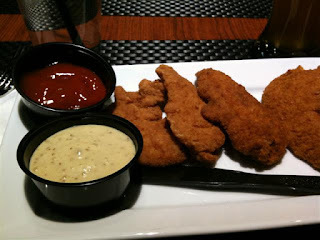 For lunch I went for my go to bar food- chicken fingers. For one thing, this place sure doesn’t skimp on the quantity. First the huge beer then this platter filled with six huge chicken fingers. The fingers were okay- pretty standard fare. Definitely not the best ones I’ve ever had but certainly not the worst. If there weren’t so many good televisions at NY Sports Grill I probably wouldn’t return but it was perfect for watching some skiing while I waited for my flight. So that’s pretty much my short guide to dining at JFK’s Terminal 5. I’m still waiting for them to open up that damn Pomme Frites joint. The sign has been up forever but no action as of yet. What could possibly be taking so long??? That is a shocking garnish... it would topple any ordinary serving glass. Really?? Sestive? Festive Siesta! Love it.